Since that other sci-fi mega-franchise with “Star” in the title has been hogging the limelight for the past few weeks, it makes sense that Star Trek might want to remind everybody that, hey, it’s still in the game too. What we definitely weren’t expecting, however, was the revelation that director Roberto Orci would allegedly no longer be at the helm of Trek’s next installment. While the whys and wherefores of that shocking announcement remain to be seen, we now have some information about where the story might have headed in Star Trek 3…or at least in the version of Trek 3 that would have been directed by Roberto Orci. Devin Faraci over at Badass Digest has been sniffing around his sources since the story broke, and he claims production on Trek 3 was shut down by Paramount last month, with one of the primary contributing factors being the state and direction of the script. That script was being written by Orci in collaboration with up-and-coming screenwriters Patrick McKay and J.D. Payne, who had also been tapped to write a Flash Gordon remake. There were rumors about Trek 3’s story, of course — it was supposed to officially kick off the Enterprise’s five-year mission of exploration, with both William Shatner and Leonard Nimoy rumored to be appearing as older versions of Kirk and Spock, respectively. But very little had been actually confirmed. According to Badass Digest, however, the Trek 3 script in question would have returned to a trope Trek has used oh so many times before: time travel. …my sources tell me that the script Orci was working on saw the Enterprise, the Vulcans and a new alien race competing to get a time travel device. The Vulcans want to go back and stop the destruction of their planet, and the time travel schtick is what would allow Chris Pine and William Shatner to share the screen. 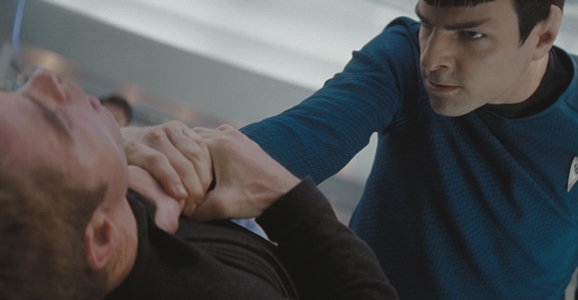 Whatever your feelings about J.J. Abrams’ two Trek films, that’s a potentially huge decision for the sequel to make. After all, the destruction of Vulcan was, more than anything else, a clear declaration that nothing could be taken for granted in Abrams’ new Trek timeline. Of course, Star Trek Into Darkness then immediately tossed that clean slate out the window by focusing the sequel on Star Trek’s most iconic villain of all time, a narrative choice that just begged to be negatively compared to Wrath of Khan, no matter how good or bad the new version was. Maybe Spock will Pon farr on Uhura face? Who, besides Orci, thought hiring Orci was a good idea? Now, given how many times we’ve fallen back on the time-travel trope, I’m still amazed (and grateful) that we haven’t returned to the Guardian of Forever. At least that remains unsullied. That being said, there has to be some TOS concepts that are good enough to base a movie on. And for Christ sake, can we get Jack Black or Nick Frost to play Harry Mudd? In those old episodes, I loved the Kirk/Mudd relationship. Faraci is bs Orci just said time travel was never considered for the plot and implied he more or less admitted the decision to not direct was his.